I’m in a puff pastry phase! Well, I have a weakness for puff pastry, the flaky crispy pastry dough… I just love it! It’s one of the staple ingredients I always keep in my freezer. It always come in handy, and it’s never wasted. I love how it dresses up any menu. You can top or fill it with just about anything you like and have an outstanding appetizer or dessert. For the holidays or any special occasion, these spinach and cheese puffs would make a fantastic addition to any menu, simple delicious flavors in one cute little appetizer. In this version, I used Brie cheese but feel free to substitute it with any cheese you like. When thawing frozen puff pastry be sure to give it time. You can thaw the sheets, wrapped, overnight in the refrigerator or just lay it out on the counter for about 30 minutes. Preheat the oven 350ºF (180ºC). Line a baking sheet with parchment paper. Put the spinach in a bowl; stir in half the beaten egg and the nutmeg. Roll out the pastry on a floured surface into a rectangle (16 x 8 in / 40 x 20 cm) and trim the edges. Lightly flour the top of the pastry and cut the rectangle into 4 pieces, each about 4in (10 cm) wide and 8in (20 cm) tall. Cut 1 in (2.5 cm) thick wide strips diagonally on both sides of the pastry, leaving the center intact. Try to cut an equal number of strips on both sides. Lay pastries out on a baking sheet lined with parchment paper. Divide the spinach equally between the squares, in the center, top it with brie slices then braid by crossing the strips over the filling alternating from side to side. (Here's an excellent quick video to watch that explains it much better)! Brush the tops of the pastries with the remaining beaten egg (add a tbsp of water), then sprinkle some sesame and poppy seeds over each pastry. Bake 20 to 25 minutes, or until puffed and golden. Préchauffez le four à 180ºC. Chemisez une plaque de cuisson de papier sulfurisé. Mettez les épinards dans un saladier, ajoutez la moitié de l'œuf battu. Assaisonnez de sel, poivre et de noix de muscade. Déroulez la pâte sur un plan de travail fariné en un rectangle de 20 x 40 cm. Coupez les bords. Découpez des franges diagonales sur les deux côtés en laissant le centre intact. Placez les feuilletés sur la plaque chemisée. Divisez la garniture d'épinards entre les rectangles, sur le centre, ajoutez les tranches de brie, puis commencez à tresser les bandes, repliez les franges par la gauche à droite en alternance. (Voici une vidéo qui explique le processus)! Badigeonnez la surface du restant du jaune d’œuf battu avec un peu d’eau, parsemez de graines de sésame et de pavot et faites cuire au four 20 à 25 mn. These photos are mouth watering...I want to dive in and eat one of these! This is the second puff pastry recipe that I've seen this morning. I guess I'm in a puff pastry kick too. I love your photos, this looks amazing! Now I have 2 things to make on my list! That is a terrific appetizer idea. A mouthwatering flavor combo - my favorite! Brie is such a fabulous cheese. What a wonderful way to use puff pastry. This recipe is a keeper for sure. Fantastic photos, too. These look amazing! I love your blog too! I'm making puff pastry next week and I'm definitely making these. They look amazing. Great blog! Those puff pastries look absolutely mouth-watering! I need more puff pastry in my life! These look delectable! comme ça me donne faim ! au brie : miam ! I love puff pastry too. These puffs look wonderful! I also have to tell you that I'm a big fan of your minestrone soup :) Thank you! Hola Chicho! These look yummylicious! I am a spinach fanatic, so I know I'll love these. J'aime !! Et ils sont très beaux ! They look lovely........but I love puff pastry anything. Have a great 2011. They look beautiful and so mouth watering! Thanks for sharing! Belles photos et c'est une chose qu'on ne peut pas résister si offerte! tu as de la chance en FRance la pâte feuilletée est pur beurre et excellente. Oh goodness! It's just after 9:00 pm and I didn't feel like having dinner tonight but I've been craving a savory snack and you've no idea how badly I want one of these! They look amazing! Cherine, I'm in the middle of a puff pastry phase too! It just makes everything seem so much more decedent. These little bundles look like heaven! These look golden and light...I'm tempted for sure! They look soo delicious and mouthwatering. I love puff pastries and it's even better with melted cheese. Puff pastry is the best for a quick appetizer, I love how versatile it is, and spinach and brie sounds like a great combination. That last picture is making my mouth water! Gorgeous pastry!! It turned out perfectly. How good do these look?! 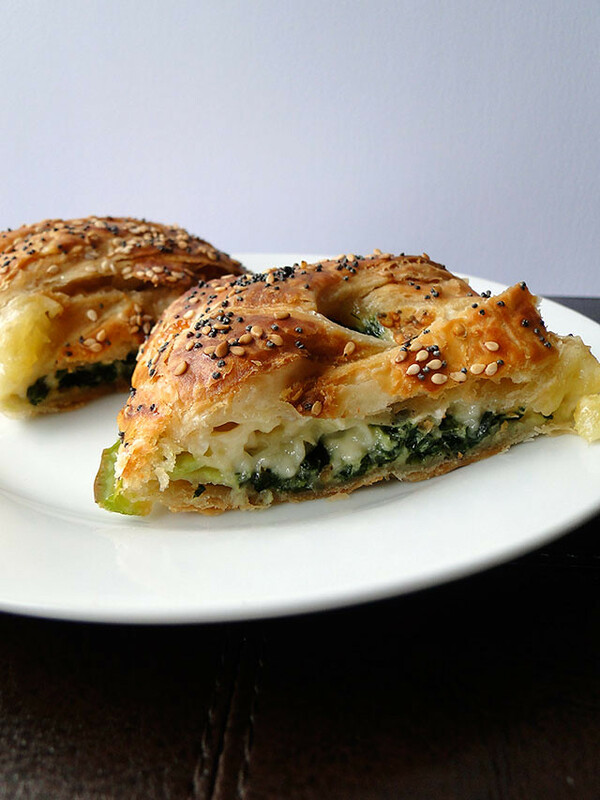 I love that spinach and brie combo and you just made it better by adding puff pastry to the mix. Yum! omg these puffs look so darn GOOD! Excellent shots! YUM YUM! I love this kinds of stuff! Great blog and pictures! Happy New Year! Such a wonderful treats. Puff pastry is my favorite as well, it's versatile and delicious. Well, I love your phase! 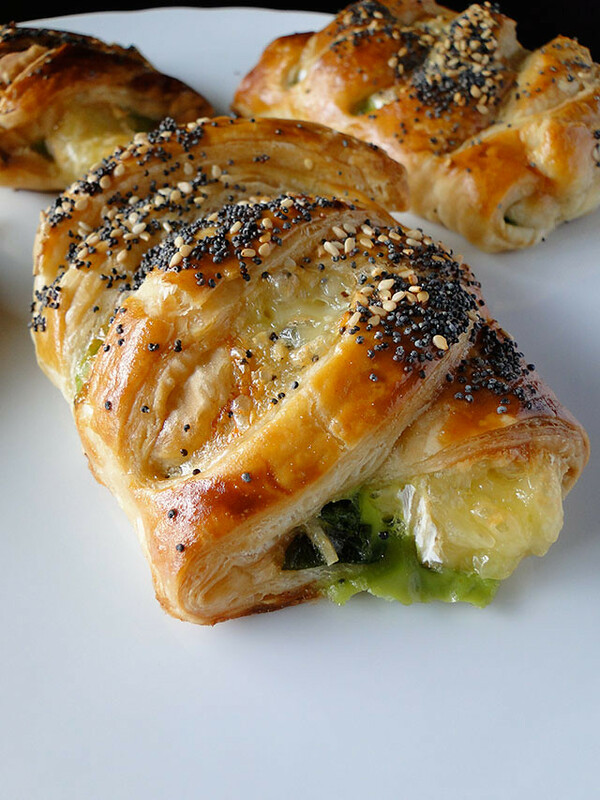 I love puff pastry too and these with brie and spinach filling looks scrumptious! Happy New Year Cherine! Ummmm, that is so appetizing. Happy New Year. Oh my goodness, Cherine--I am almost speechless. These are nothing short of stunning! Your blog is so bright and colorful, and your photos are always so astonishing. I just love it. 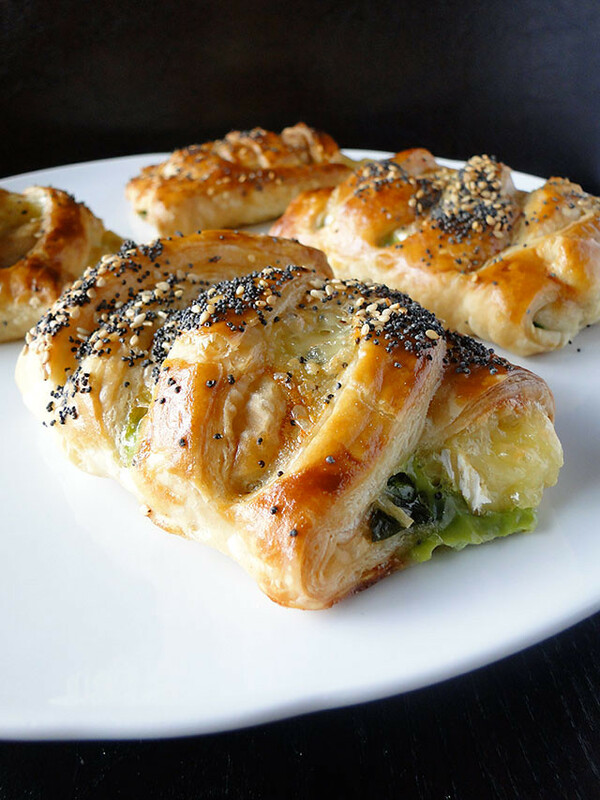 spinach, oozing brie, PLUS puff pastry=heaven! love the sesame and poppy seeds, great texture and flavor! J'ai pratiquement envie de tout, quelle belle cuisine, gorgée de légumes comme j'aime. Je te souhaite une merveilleuse nouvelle année! Just stopping by to tell you that we used your recipe for our latest gourmet group dinner as the appetizer. Added some caramelized onions and red pepper flakes for a little 'kick'. They were delicious!